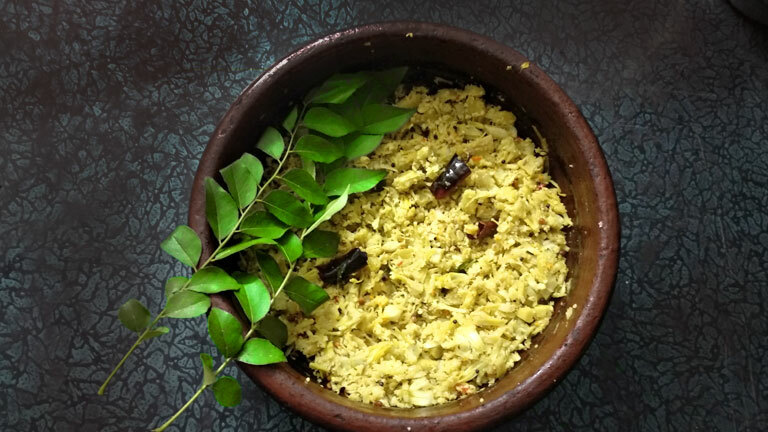 Idichakka Thoran is a side dish made out of fresh tender jackfruits and flavoured with crushed coconut. In a pressure cooker, cook jackfruit pieces with ¼ cup of water. Wait for one whistle and let it cool. Now split it with hands. In a pan add oil and splutter mustard seeds and urad dal. Add dried red chilies and curry leaves. To this add coarsely ground coconut, cumin seeds, garlic and curry leaves. Sauté well.